Below is an art­icle I recently wrote for the excel­lent European drug policy reform organ­isa­tion, European Coali­tion for Just and Effect­ive Drug Policies — ENCOD. And here is the link to the ori­gin­al on the ENCOD web­site. I have had the hon­our of serving as the European Dir­ect­or of Law Enforce­ment Against Pro­hib­i­tion (LEAP) for the last four years, and have been thrilled to over­see the estab­lish­ment of thriv­ing nation­al groups in the UK and Ger­many, with the pos­sib­il­ity of more on the hori­zon. In my view, law enforce­ment offers a unique and crit­ic­al voice to the inter­na­tion­al drug policy reform debate. LEAP, foun­ded in 2002, today has over 150,000 sup­port­ers and speak­ers in 20 coun­tries. We con­sist of police officers, law­yers, judges, pris­on gov­ernors, pro­ba­tion officers, intel­li­gence and mil­it­ary per­son­nel, and even inter­na­tion­al drug czars. What unites us is a shared pro­fes­sion­al know­ledge, exper­i­enced across the full spec­trum of law enforce­ment, that drug pro­hib­i­tion has egre­giously failed. Over the last 50 years glob­al drug use has expo­nen­tially increased, the potency of illeg­al drugs has increased, they are ubi­quit­ously avail­able, and the price of street drugs has gone through the floor. Faced with this inform­a­tion, how can our gov­ern­ments claim they are win­ning the “war on drugs” to cre­ate a “drug free world”? Quite the oppos­ite – pro­hib­i­tion has enabled a glob­al and expo­nen­tially grow­ing black mar­ket. I became aware of drug pro­hib­i­tion fail­ure while I was work­ing for MI5 back in the 1990s. One of my post­ings involved invest­ig­at­ing ter­ror­ist logist­ics, which meant that I had to work closely with UK Cus­toms across the UK. This exper­i­ence made me aware that the “war” had been lost. It also made me very aware, early on, that there was a massive over­lap between the illeg­al drug mar­ket and ter­ror­ist fund­ing. The US DEA estim­ates that over half the des­ig­nated ter­ror­ist groups around the world gain the bulk of their fund­ing from drugs money. So on the one hand pro­hib­it­ing drugs and fight­ing the “war on drugs” sends the mar­ket under­ground and the res­ult­ing massive profits provide a key rev­en­ue stream to ter­ror­ists, not least ISIS which con­trols part of the flow of heroin from cent­ral Asia into Europe. On the oth­er hand the West is also waging the “war on ter­ror” to fight these same groups. So what our gov­ern­ments give the mil­it­ary-secur­ity com­plex with one hand, they also give with the oth­er. But is not all bad news. Coun­tries in Lat­in Amer­ica and states in North Amer­ica are leg­al­ising can­nabis, safe injec­tion rooms have rolled out across Europe, Canada is look­ing to leg­al­ise can­nabis, and the decrim­in­al­isa­tion of drugs has been hugely suc­cess­ful in coun­tries such as Por­tugal and the Czech Repub­lic. Even at the UN level, which recently held a once-in-a-gen­er­a­tion Gen­er­al Assembly Spe­cial Ses­sion in New York, the concept of harm reduc­tion is at least now being tabled by some coun­tries, although the pro­gress is gla­cial. The times may not be chan­ging fast enough for many of us in the drug policy reform world, des­pite baby steps being made in the right dir­ec­tion by some coun­tries. Yet even the more pro­gress­ive coun­tries with­in the inter­na­tion­al com­munity are still con­strained by the leg­al straight jack­et that is the UN drug treaty frame­work. And while harm reduc­tion is good pro­gress in that it no longer crim­in­al­ises those who choose to use, it utterly fails to address the big­ger prob­lem that I men­tioned before: that the crim­in­al­isa­tion of cer­tain drugs drives the mar­ket under­ground, provid­ing huge profits to organ­ised crime car­tels and ter­ror­ist groups around the world every year. Pro­hib­i­tion has unleashed the biggest crime wave the world has ever seen. As with alco­hol pro­hibiton in 20th cen­tury Amer­ica, only leg­al­isa­tion and reg­u­la­tion will remove this mar­ket from the greedy grasp of crim­in­als. I have just watched a old BBC News­night debate between comedi­an and act­or, Rus­sell Brand, and right-wing writer and com­ment­at­or, Peter Hitchens. The debate encap­su­lated the entrenched pos­i­tions of both the reform­ist and pro­hib­i­tion­ist camps. The former was rep­res­en­ted by Brand, a former drug user in recov­ery, advoc­at­ing abstin­ence-based ther­apy. The lat­ter by Hitchens, an anti-drug war­ri­or largely approach­ing the issue from a mor­al­ity pos­i­tion, who argued that tak­ing drugs is a crime and that all such crimes should be pro­sec­uted as a deterrence. While nat­ur­ally I lean more towards the pos­i­tion of Brand, who two years ago elec­tri­fied a rather tur­gid annu­al UN Com­mis­sion on Nar­cot­ic Drugs meet­ing in Vienna by call­ing for full drug leg­al­isa­tion, and also while respect­ing his per­son­al exper­i­ences, I do think he’s miss­ing a trick. Yes, those with drug depend­en­cies need help and com­pas­sion not pris­on, but the vast major­ity of those who choose to use do so recre­ation­ally, just for fun, and nev­er devel­op an addic­tion, just as only a minor­ity of those who choose to drink go on to devel­op alco­hol­ism. And yet the para­met­ers of the drug debate rarely stray bey­ond the well-worn issue of “prob­lem” users, both amongst reform­ist as well as pro­hib­i­tion­ist circles. We do not call all drink­ers alco­hol­ics so why, in the pub­lic dis­course, are all users of oth­er drugs clumped togeth­er as “addicts” in high-pro­file debates? In 2014 LEAP pub­lished a Pro­posed Amend­ment of the UN Treat­ies, in which we argue that all drugs should be brought with­in the orbit of the World Health Organ­isa­tion Frame­work Con­ven­tion on Tobacco Con­trol (2003). We argue that only full reg­u­la­tion and con­trol of the drug mar­ket will end the scourge of the illeg­al glob­al drug trade. Until this hap­pens at least $320 bil­lion per year profits will con­tin­ue to bene­fit only crime car­tels and ter­ror­ist organ­isa­tions. The “war on drugs” has failed. Albert Ein­stein, who was not exactly a dullard, said that the very defin­i­tion of insan­ity was to con­tin­ue to do the same thing, even if it repeatedly fails, in the hope that you will even­tu­ally get a dif­fer­ent out­come. That is what we are see­ing with pro­hib­i­tion. It is time for this insan­ity to cease. 30C3 — The Four Wars; Ter­ror, whis­tleblowers, drugs, inter­net from Annie Machon on Vimeo. Akzept Kon­gress 2013 from Annie Machon on Vimeo. As I have men­tioned before, the Dutch geek­fest Observe, Hack, Make (OHM 2013) was not just a chance for geeks to play with cool tech toys, the whole event also had a very strong polit­ic­al track. While there was inev­it­ably a lot of focus on whis­tleblow­ing in the wake of the Snowden dis­clos­ures, anoth­er speak­er track attrac­ted a lot of atten­tion: glob­al drug policy and the fail­ure of pro­hib­i­tion. This was a track I sug­ges­ted and I was pleased that three speak­ers were giv­en the chance to dis­cuss this on the main stage. While com­ing to the sub­ject from rad­ic­ally dif­fer­ent per­spect­ives and exper­i­ences, the under­ly­ing mes­sage of all three was that the “war on drugs” was an abject fail­ure that caused massive and increas­ing harm to the glob­al pop­u­la­tion. John Gilmore was first up. John made his dosh dur­ing the tech boom, and has since spent sig­ni­fic­ant sums try­ing to reform the failed drug policies with­in his home coun­try, the good ol’ US of A. Of course, there, it was always going to be an uphill battle. The USA is the foun­tain head of pro­hib­i­tion, ram­ming the drug con­ven­tions of 1961, 1971, and 1988 through the United Nations by brute dip­lo­mat­ic force. To this day, the US remains the key power ensur­ing that the UN upholds these con­ven­tions, des­pite the fact that the policy of pro­hib­i­tion has mani­festly failed, des­pite the fact that many coun­tries have exper­i­mented suc­cess­fully with harm reduc­tion and decrim­in­al­isa­tion of per­son­al use, and des­pite the fact that these laws are from a dif­fer­ent era and are wildly out of date — in the 1960s HIV and AIDS had yet to emerge, and rap­idly mutat­ing “leg­al highs” were unknown. And let’s not for­get that the USA is the world’s biggest con­sumer coun­try of drugs. It is Amer­ica that drives this illeg­al mar­ket. And it is in Amer­ica that 20 states have leg­al­ised the medi­cin­al use of can­nabis, and two states have fully leg­al­ised the use even, gasp, purely for pleas­ure. The hypo­crisy is breath­tak­ing. But change is afoot. Primar­ily, I believe, because the USA no longer needs the “war on drugs” as a pre­text for invading/interfering with oth­er coun­tries, now it has the “war on ter­ror”. But also because of the excel­lent work of research and edu­ca­tion­al civil soci­ety groups. The Beckley Found­a­tion, set up by Aman­da Feild­ing in 1998, is one such. Aman­da gave an excel­lent talk, focus­ing on the dual nature of Beckley’s work: policy and sci­entif­ic research. Her view is that sound nation­al and inter­na­tion­al policy can­not be developed unless it is based on evid­ence, research and facts. Yet the cur­rent “war on drugs” has become almost an art­icle of faith that too many politi­cians are afraid to chal­lenge. Beckley aims to provide the research and the facts. It funds and estab­lishes sci­entif­ic research that enables lead­ing sci­ent­ists, such as Pro­fess­or Dav­id Nutt in the UK, to research the poten­tial thera­peut­ic bene­fits of cur­rently illeg­al drugs, and also to assess the dif­fer­ent soci­et­al harms caused by all drugs, both licit and illi­cit. To date, the pro­hib­i­tion ortho­doxy has inhib­ited free sci­entif­ic research to the det­ri­ment of many people across the plan­et. Aman­da was pleased to be able to announce two new research pro­jects just start­ing in the UK, into the poten­tial thera­peut­ic bene­fits of psilo­cybin (magic mush­rooms) and LSD. Beckley has also recently com­mis­sioned a cost bene­fit ana­lys­is of the leg­al­isa­tion of (only) can­nabis is the UK. The res­ults will be form­ally announced in Septem­ber, so for now I shall con­fine myself to say­ing that they are encour­aging. Using such research, Beckley is thus in a pos­i­tion to advise gov­ern­ments about devel­op­ing fact-base policy. One of the key areas of the world invest­ig­at­ing poten­tially bene­fi­cial altern­at­ives to pro­hib­i­tion is Lat­in Amer­ica, and Aman­da has developed close work­ing rela­tion­ships with a num­ber of gov­ern­ments across the region. And under­stand­ably so — Lat­in Amer­ica, as one of the key pro­du­cer regions of the world, has been rav­aged by the drug wars. Viol­ent organ­ised crime car­tels have grown so wealthy and power­ful that they can sub­vert whole coun­tries, cor­rupt gov­ern­ments and law enforce­ment, and ter­ror­ise whole pop­u­la­tions in their quest to dom­in­ate the illeg­al drugs trade. In Mex­ico, since the war on drugs was ramped up 7 years ago, it is estim­ated that over 70,000 inno­cent people have been kid­napped, tor­tured and killed in drug-related viol­ence. Many have simply been dis­ap­peared. Finally I also did a talk at OHM as the European dir­ect­or of Law Enforce­ment Against Pro­hib­i­tion (LEAP). LEAP is a unique voice in the glob­al drug policy debate. The organ­isa­tion, only 11 years old, has over 100,000 sup­port­ers and a pres­ence in 120 coun­tries. We con­sist of police officers, judges, law­yers, pris­on gov­ernors, intel­li­gence per­son­nel, and even drug czars. What unites us is a shared pro­fes­sion­al know­ledge, exper­i­enced across the spec­trum of drug law enforce­ment, that pro­hib­i­tion has egre­giously failed. Over the last 50 years drug use has expo­nen­tially increased, the potency of illeg­al drugs has increased, they are ubi­quit­ously avail­able, and the price of street drugs has gone through the floor. Faced with this inform­a­tion, how can our gov­ern­ments claim they are win­ning the “war on drugs” to cre­ate a “drug free world”? Quite the oppos­ite — pro­hib­i­tion has enabled a glob­al and expo­nen­tially grow­ing black mar­ket. I became aware of the drug pro­hib­i­tion fail­ure while I was work­ing for MI5. One of my post­ings involved invest­ig­at­ing ter­ror­ist logist­ics, which meant that I had to work closely with UK Cus­toms across the UK. This exper­i­ence made me very aware that the “war” had been lost. It also made me very aware, early on, that there was a massive over­lap between the illeg­al drug mar­ket and ter­ror­ist fund­ing. The US DEA estim­ates that over half of the des­ig­nated ter­ror­ist groups around the world gain the bulk of their fund­ing from drugs money. So on the one hand pro­hib­it­ing drugs and fight­ing the “war on drugs” sends the mar­ket under­ground and that black money provides a key rev­en­ue stream to the ter­ror­ists. On the oth­er hand the West is also waging the “war on ter­ror”. What they give with one hand they take away with anoth­er. One stark example of this is the cur­rent melt-down in Libya — coun­try that was “grate­fully” lib­er­ated by NATO two years ago. The dic­tat­or was tor­tured and killed, MI6 and the CIA were help­ing the “spon­tan­eous” rebels. the infra­struc­ture was ruined, and the bulk of the coun­try is now run by ban­dit mili­tias which bru­tal­ise the inhab­it­ants pr impose hard-line Islam­ism on them. Many pre­dicted this would hap­pen, includ­ing myself. What was not pre­dicted was the explo­sion in the drug trade. Over the last dec­ade west­ern Africa has become one of the main trans­it regions between the pro­du­cer coun­tries (Lat­in Amer­ica) and the con­sumer coun­tries in Europe. It now appears that this luc­rat­ive trade has not only res­ul­ted in destabil­ising coun­tries, lead­ing to viol­ent narco-states such as Mali and Guinea-Bis­sau, the trade has also become a stream of income to Al Qaeda affil­i­ated groups in Libya. Which is bad for west­ern secur­ity, is bad for the sta­bil­ity of Libya, but is also bad for the people of Libya, where there has reportedly been an explo­sion of drug use and rock­et­ing infec­tions of HIV. There have been many suc­cess­ful attempts to alle­vi­ate the pen­al­isa­tion of drug users in many European coun­tries — Por­tugal, the Neth­er­lands and Switzer­land spring to mind. Because of more lib­er­al decrim­in­al­isa­tion laws, all these coun­tries have seen a decrease in drug use and asso­ci­ated crime, plus good health out­comes and the free­ing up of law enforce­ment resources across the spec­trum to go for the drug traders. How­ever, we in LEAP would argue that only full reg­u­la­tion, con­trol and tax­a­tion of the drug mar­ket will deal with the scourge of the inter­na­tion­al drug trade. Until that hap­pens, this glob­al trade, estim­ated by even the UN at being worth between $320 bil­lion and $500 bil­lion per year, will only profit organ­ised crime car­tels and ter­ror­ist organ­isa­tions. The “war on drugs” has failed. Albert Ein­stein said that the very defin­i­tion of insan­ity was to con­tin­ue to do the same, even if it repeatedly fails, in the hope that you will even­tu­ally get a dif­fer­ent out­come. That is what we are see­ing with pro­hib­i­tion. And the geek com­munity under­stand this too. Of course they do, they are sci­ent­ists. I was heartened by their interest and by their response. Let’s all cam­paign to end this insan­ity. 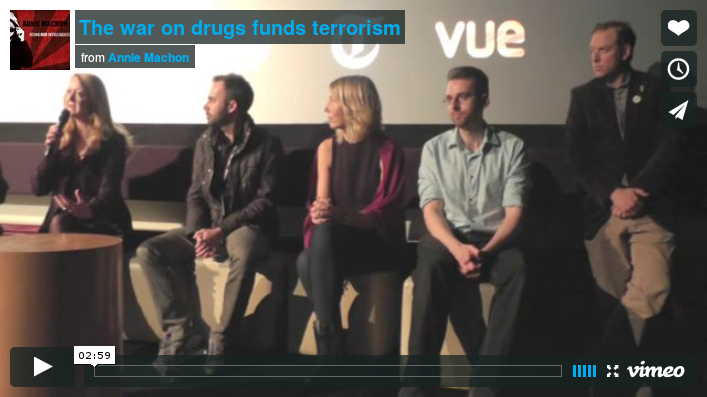 LEAP — End­ing the war on drugs and people (OHM 2013) from Annie Machon on Vimeo. This com­ing week­end NORML UK will be hold­ing its first AGM and nation­al con­fer­ence in Bris­tol. Mr Nice, aka Howard Marks, will be open­ing the event and speak­ing on the Sat­urday night dur­ing the two-day event. Join­ing the event to dis­cuss the need for a sens­ible and evid­ence-based rethink about drug policy will be many oth­er speak­ers from groups such as Trans­form, Stu­dents for Sens­ible Drug Policy, the Beckley Found­a­tion, Release, former Chief Con­stable of Cam­bridge­shire Tom Lloyd, and of course, Law Enforce­ment Against Pro­hib­i­tion. The head of LEAP UK, former Met police detect­ive and forensic money-laun­der­ing expert Row­an Bos­worth-Dav­ies, will be speak­ing on Sunday19th May. I shall be speak­ing at the con­fer­ence on the Sat­urday after­noon, and then enjoy­ing the even­ing with Howard Marks et al. Come along if you can. Ice­land TV 2 from Annie Machon on Vimeo.